In part one of a two-part series on cycling in the beautiful Ile-de-France region, Mark Cramer explains how to get out of Paris by bike. Not every cyclist finds the traffic in Paris such a doddle. When it’s time to hit the road, Parisians are like human plants: they bend toward the sun, toward the south. But right around the corner from light-starved Paris, you find the eclectic region of Ile-de-France, home of grainy villages, varied terrain and remarkable history, but censored from the map of most tour operators. Paris is actually part of Ile-de-France, but for many who reside within the Périphérique “rampart”, Ile-de-France is too near for a vacation and too far from the image of what a vacation should be: no beaches and no mountains, but big-box-store blight and Stalinist high-rise housing. But if you do some exploring, you will find some attractively rugged landscapes outside of Paris, in the Chevreuse (south-west) and the Vexin (north), for example, as well as the type of cobblestone streets lined with colourful townhouse shutters that you’d expect to enjoy in Provence or Dordogne. 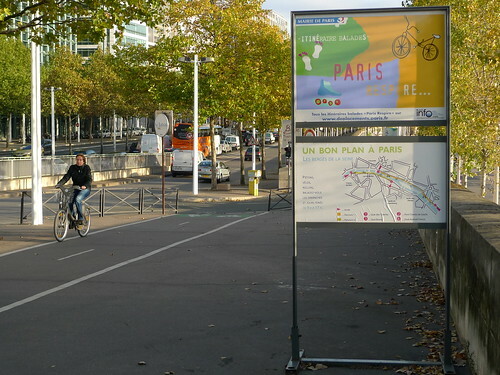 There are three possible strategies for doing bicycle trips in Ile-de-France. Plans 2 and 3 will be explained in a follow-up article. Plan 1. Do it yourself. Bicycle from Paris in several directions and you will reach the country in two hours. I’ve done this by trial and error, and thanks to my wrong turns and unexpected dead-ends, I am now able to suggest the best escape routes. However, plans 2 and 3 will spare you from stretches of suburban congestion. Plan 2. Take overnight trips. Plan 3. Buy a weekly or monthly suburban pass, the Navigo, and hoist your bike into a Transilien train out of Paris so that your cycling will begin in a rural area or at the edge of one. Which way? Navigating your way out of Paris can be tricky business. 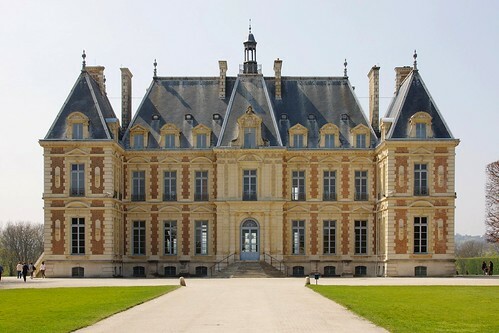 For purists who don’t want hop on a get-away train, there are several ways out of Paris. It’s an adventure but it steals time from open road cycling. Begin at Place Stalingrad and follow the bike path past La Villette, along the Canal de l’Ourq. Takes you through funky industrial and railroad zones. Once or twice the path changes sides of the canal and you have to walk your bike over a bridge. Eventually you reach the shady green Forêt de Sevran, where you continue along the canal on a protected bike path. Once past Ville Parisis, the glorious bike path ends at Claye-Souilly. Turn left on D404 for a couple of kilometres and turn right on D139 at Messy. Now you’ll have small departmental roads to choose from, with sparse traffic, if any. If you have the time and the ambition, choose your route to either Compiègne or the castle town of Pierrefonds, both about 88km from Paris. To reach either of these destinations, you deal with a protracted climb into the Compiègne Forest. Begin just across the Périphérique in Clichy. Cross the Pont de Genvilliers and a comfortable bike path will materialise after about 50 metres. Takes you through industrial zones, with wooded oases here and there, including a pretty towpath along the next meander of the Seine. Crossing the bridge over the Seine into Epinay, you need to navigate left for a couple of kilometres by urban road (not much traffic) to the resort town of Enghien. The bike path restarts with a left turn just before the Enghien Lake. Eventually, two kilometres past the splendid Enghien race track, you’ll have to take D928 which skirts the steep and deep Montmorency Forest. A mellow rise is followed by a long descent into Auvers-sur-Oise. Auvers is a gateway to the rolling farmlands of Le Vexin, and eventually Normandy. 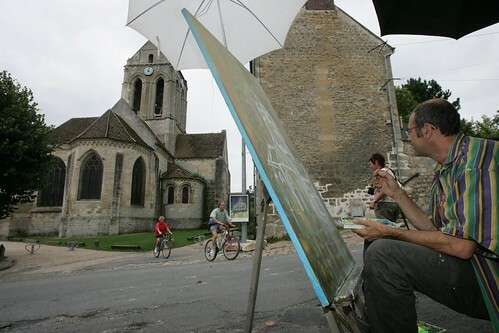 At Auvers you’ll compare an imposing church on the top of the hill to the Van Gogh version of that church. A few metres away are the tombs of Van Gogh and his brother. Nearby are the pretty towns of Butry-sur-Oise and Valmondois (home of Daumier), leading you into the hilly Vexin farmlands. The Van Gogh brand of yellow comes from the fields of the Vexin. Beginning on the Rive Gauche of the Seine, directly across the river from Charenton-le-Pont, follow a protected riverside bike path through industrial zones until Choisy-le-Roi. Cross the bridge and continue the bike path (with a 1-kilometre stretch of road riding) to Villeneuve Saint-Georges. The locals told me this town was the starting point of the first Tour de France on July 1, 1903. Continue until the end of the bicycle path, and follow the signs over a few blocks of easy residential street riding with no traffic to the Forêt de Sénart. Cross the forest in a south-easterly direction. A bike path will take you through the town of Combs-la-Ville and you’ll hit D48, taking you through farmlands and hamlets in the Brie-Comte-Robert region. Cross Vincennes Forest, east of Paris, past the Vincennes race course, to Joinville-le-Pont. Begin the Bords de la Marne at the Joinville bridge. Make sure you turn left at the end of the Pont de Joinville and descend to the river side. Pass by the Guingettes, weaving through restaurant tables on the bike path, and then enjoy a relatively smooth river ride, with unusual hillside houses on your right and luxuriant islands on your left. Reach the Base de Loisirs de Vaires-Torcy. Some street riding through St-Thibault-des-Vignes takes you to the pretty town of Lagny, with its classic French centre-ville. Across from the Marne from Lagny is Thorigny, where a steep hill (perhaps as challenging as a col in the Alps), hairpins you up to a plateau, and farmlands. I have mixed feelings about these trips, which began out of pure faith: “the Paris region is not nearly as sprawling as other major urban centres,” I told myself, “so there must be a way to bicycle to the real country.” In the beginning, I tried and failed many times, defeated by confusing signs (or no signs at all), wrong turns and beautiful distractions along the way. Eventually I made it. But in the end, I have more often opted for Plan 2 (overnight trips) and Plan 3 (using Paris as a base for daily excursions). On suburban trains, I’ve met a number of seasoned cyclers who prefer Plan 3. However, knowing how to get out of Paris on two wheels has served as a very useful context, with superb surprises along the way. The Forêt de Sevran, the Parc de Sceaux, Bords de la Marne, Auvers-Sur-Oise, and the Forêt de Sénart are all worthy destinations in themselves. In the end, these trial-and-error rides provided me with a context to better take advantage of overnight trips and daily excursions departing from Paris, as you will read in the second part of this article. Part 2 includes the splendid medieval city, a mini-Venice with canals, surprising panoramic views, one-of-a-kind museums, wild forests and a city where horses have the right of way. A Blay Foldex map of Ile-de-France or a similar map from the Institut de Géographie Nationale (IGN) is also useful because it will have the smaller roads marked more clearly and offer a more extended version of Ile-de-France. IGN also publishes a dedicated cycling map of Ile-de-France with 100-odd routes marked on it. Originally published in 2004, some routes may be out of date, though, and as we haven't used it, we can't verify its quality. Finding a bike-friendly hotel in Paris can be hard – click the icons on our map below to see accommodation options with dedicated bike storage or places where you're allowed to lock your bike in your room.